The Pacific humpback's pectoral fins are white underneath & black on top.. 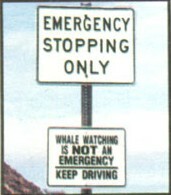 While in their breeding grounds- the whales do NOT eat! Some humpbacks feed in the Southern Ocean and go north to their reproductive areas! There are 2 'genetically' distinct forms of orcas, known as "transients" and "residents"
A versatile predator and has one of the most varied diets of all cetaceans. It is known to eat anything from squid, fish, and birds to sea turtles, seals, and dolphins; it will even tackle animals as large as Blue Whales! Where to Look: One of the most wide-ranging mammals on earth, though distribution is patchy. Seen more often in cooler waters than in the tropics and subtropics. Where to Look: Found in Arctic feeding grounds April to November, and in Mexican breeding grounds December to April. Migrates south October to February, and north February to July. The largest living creature on Earth! A blue whale's "blow" can reach as high as 30 feet! During the feeding period, a blue whale can ingest 4 tons of krill a day. They feed at the beginning and the end of the night at a depth of at least 130 feet (40 m). Where to Look(Pacific): Channel Islands (near Santa Barbara, CA) during July & August, Also- warm, temperate waters of the Pacific and Indian Oceans. They migrate as far north and south as the Arctic and Antarctic Oceans during the summer. The Right whale's baleen is ~ 12 inches long! *Great* Video- Animal Planet's "Quest: Swimming with Giants"
"The world's first commercial whale watching occurred in southern California in early 1955, when Chuck Chamberlain, a fisherman from San Diego, put out a sign that said, simply, "See the Whales-- $1." Source: The Little Guides "Whales Dolphins & Porpoises"
Be patient- even if you only see one whale- it is something you'll never forget! If you get seasick often, take medication or get a patch- it helps! Be prepared to get wet- if you have a "nice" camera- bring something to keep it covered! American Cetacean Society's Blue Whale Watch: Travel to Santa Barbara, CA in July and spend the day on the Condor Express- in search of Blue Whales (and other marine life)! Aquatic Adventures: Join AA for a Silver Bank (Dominican Republic) Whale Watching experience! Silver Bank Whale Watching(D.Republic): Another site that David is working on! Specific information about the Silver Bank Whale Watching experience. He has some great links as well! Delfin Amor Eco Lodge & Vida Marina Foundation: Travel to Costa Rica to see humpbacks in Drake Bay during their southern migration (July through late October) They have a 99% success rate! San Diego Hornblower Cruises: See California Grays, dolphins, and other local marine life + a great San Diego Bay tour! Vancouver, BC - Prince of Whales: Summertime whale watching to see Orcas and other marine life! Maui, Hawaii- Ultimate Rafting: One of the best whale watching trips I've been on! Monterey Bay Whale Watch - California: See California Grays, Humpbacks, Orcas, Minke, Fin and the Mighty Blue Whales - Year round! MARINEBIO.ORG: Who's mission is to share the wonders of the ocean to inspire education, research, and a sea ethic... A *MUST SEE* for marine lovers! Whale Tails Corn Chips: The Corn Chip With A Conscience... whose mission is "promote the understanding and preservation of Whales and the World we all share"
SeaSide Designs: Offers beautiful, creative jewelry with marine themes(& more). I was given a pair of "fluke" earrings as a gift that I love! Nature Photography by Leo Kulinski, Jr.: Beautiful photographs of whales, wolves, and astronomy- If you sign his guestbook, tell him Leslie sent you! The Ocean World of Wyland: Learn about all the amazing work Wyland has done for marine life.. If you like to read, don't miss out on this book: "Chicken Soup for the Ocean Lover's Soul"